Pokémon GO! A crazy little game that is taking over the world! Pokémon GO? Really? Didn’t Pokémon fall off the “cool list” a few years ago? Well guess what…it’s right back at the top now with their new app called Pokémon GO. My son is playing it, my nephews are playing it, our friends are playing it, and now even I’m playing it. Yes…I said it – I have downloaded the Pokémon GO app on my phone for me! Not for my child – I am actually competing against him! Fortunately, he is still willing to help me figure out what is going on. I don’t think he knows that secretly I want to catch more Pokémon than him!!! I found a really good description of Pokémon GO online when I was reading up on this app. 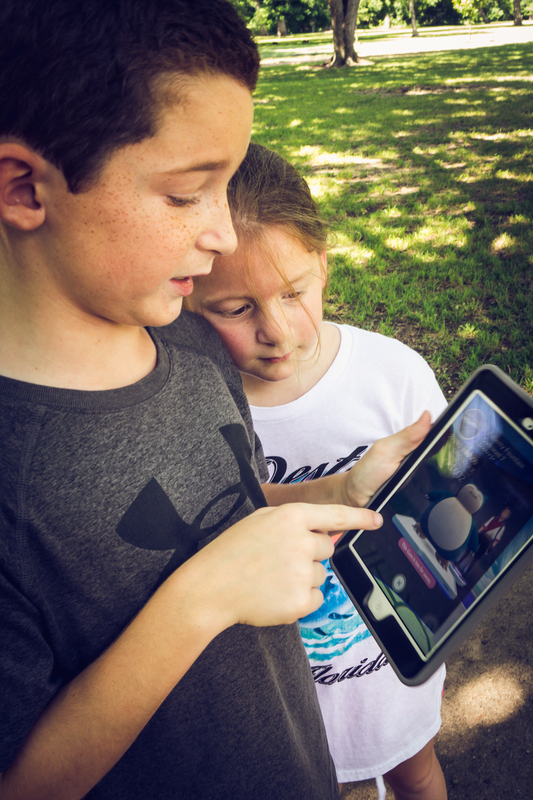 A couple of writer’s at The Washington Post described this as the first real success story of the use of augmented reality technology, which blends the digital and real world together. The combined effect is part bird-watching, part geocaching, part trophy-hunting, with a heavy dose of mid-1990s nostalgia. With all of that going on, how can you lose, right? I’m sure this will be the first of many games using augmented reality technology! If only they’d come up with one that had some 1980s nostalgia! In case augmented reality technology tripped you up (as it did me), let me clear it up for you. Wikipedia says augmented reality (AR) is a live direct or indirect view of a physical, real-world environment whose elements are augmented (or supplemented) by computer-generated sensory input such as sound, video, graphics or GPS data. Enough of that. Back to Pokémon… It had been a long time since I had really been plunked down into the world of Pokémon. Way back when my nephew was about 7 years old (he’s now in his early 20s and on Level 11 of Pokémon GO), he used to collect Pokémon cards. Lots of stops along the way – Morgan and I needed a bit of schooling when it comes to catching Pokémon. Good thing we have Zach to lead us on this crazy adventure! My sweet little nephew, Travis carried around giant notebooks filled with all of his Pokémon cards that he carried with him everywhere. If you showed the slightest bit of interest in his collection, he would quickly open up his notebook and flip through it page by page telling you each and every detail about his favorite Pokémon. Time for a little break from the world of Pokémon and Pokémon GO – for those of you who are totally lost when it comes to this game, or if like me, you are the Mom who is driving all the kids around from neighborhood to neighborhood searching for Charizard and Pinsir, you might want to check out Chardonnay GO – a great You Tube video posted by Dena Blizzard! Did you enjoy your little You Tube break? Good! Now back to Pokémon GO. According to my son, Pikachu (the cute Pokémon) is not the best choice of Pokémon to take into battle with you when playing the card game, but he is pretty cute! And in Pokémon GO, I don’t think he’s very powerful either. I finally got busy downloading the app on my phone, I opened it up, and started the game. It didn’t take long for 3 Pokémon to pop up on my screen. One was a cute little turtle thing called Squirtle – I threw a Pokéball at him, caught him, and proudly told Zach about my major score. He looked at me and said “Mom…really? You picked Squirtle? Do you know anything about Pokémon? Squirtle is pretty much the worst Pokémon in the game! Well…unless he evolves.” What??? Apparently, you don’t pick them based on whether or not they are cute. Just like when I used to play the card game with my nephew years ago – I picked my cards based on what the Pokémon looked like. I always picked the cute ones, and the sparkly ones. Well…still today in Pokémon GO, that is not a good enough reason to choose a Pokémon. What exactly is Pokémon GO? Let me try to explain it to you – it is a virtual reality game that uses a real-world map of the streets and parks where you are standing/walking. The map contains lots of information and real landmarks that are useful while you are exploring. Your character that you create when you first open the app will always be standing in the center of the map. This map will guide you to PokéStops, Gyms, and the closest Pokémon! While you’re walking around, you will be looking on your map (on your phone) for glowing areas called habitats. This is where you might find Pokémon. A little picture of the particular monster will pop up on your screen giving you a chance to throw a Pokéball at him to catch him. Pokémon love places like public parks and recreation areas. So get your phone (or iPad)and go outside to walk around to see which Pokémon are hanging out near you! 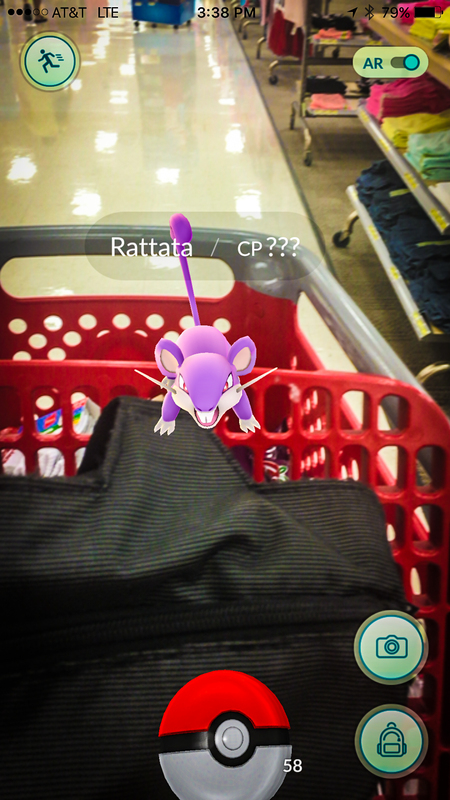 This little creepy Pokémon was sitting right on my Target basket! I quickly “threw” a Pokéball at him and caught him. The other day, I was at Target, and I accidentally opened the app. Well…maybe not accidentally, but let me tell you something – it’s a good thing I did, because according to Zach, I caught a couple of really good Pokémon – I caught Zubat & Pidgey! Need another break from all this Pokémon talk? Well here it is… Believe it or not, even Jimmy Fallon is on the Pokémon GO band wagon. 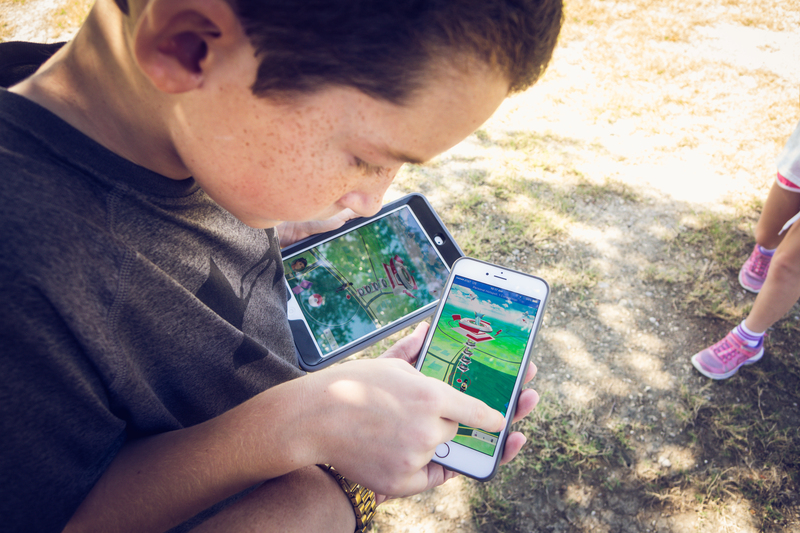 As he was trying to figure out how to play the game, he set up a Pokémon lure – this is something you turn on in your game to attract the Pokémon to your location (but you can only do this at a Pokéstop (I know – this is a lot to take in). Check out the video and news story about the incident called Jimmy Fallon Accidentally Lured Kids to His Apartment Building While Playing ‘Pokémon Go’! It’s hysterical… And a good lesson – don’t set up a lure unless you want people coming into your space! Okay…before you rush right out and try to start capturing some Pokémon, you might want to read this article from Tech Connect called Pokemon Go: 8 essential comfort, safety and happiness tips. It has a few fun (and staying safe) tips for you before you start. It also mentions some things to be aware of when you’re playing. There has been some negative press associated with Pokémon GO as well. 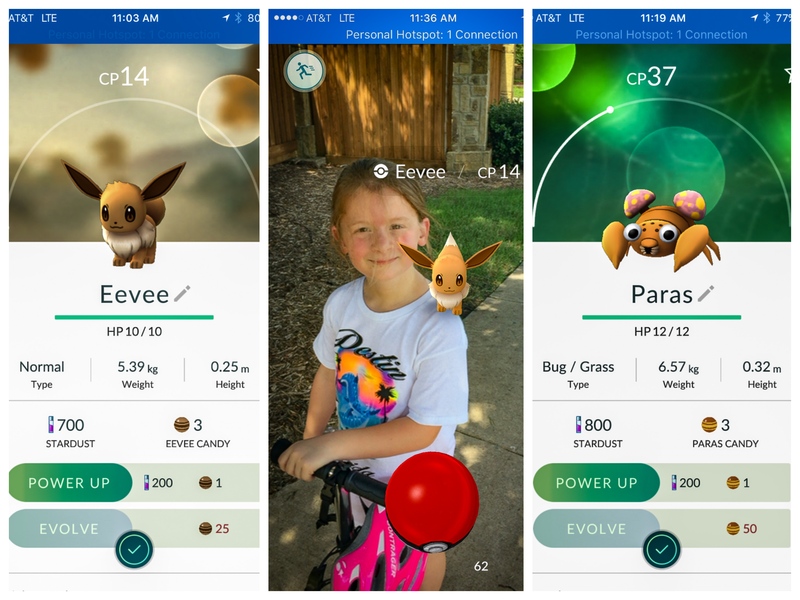 You can learn about some of it here in this article from the Washington Post called What is Really Behind the Pokémon GO Craze? Pokémon GO was first released in Australia and New Zealand on July 6, and it was released in the United States the day after. It was supposed to become available in more countries from there, but so many people are already playing the game — overloading its servers — that international rollout has been paused indefinitely. Impressive, right? He would still be walking around looking for these things if I hadn’t called it quits! It was 102 degrees outside. The rest of the Pokémon might have to wait until the Fall. Zach and I spent several hours today walking all over the neighborhood searching for Pokémon. We found several, but then he decided it was too hot and we should drive around. That way we could go farther and find more rare Pokémon monsters. Yes…I’m that Mom. According to the Pokémon GO website, driving to different types of areas is very good. Their website says It’s most effective to look for Pokémon at habitats that match where they’re most likely to live. For example, if you’re on the beach or at a pier, you’re more likely to find Water-type Pokémon. However, if you’re in a desert climate, you would be much less likely to find Water-type Pokémon. So of course we had to drive to small lakes, parks, and shopping centers to see what we could find. All in all, it was a pretty successful outing. I now find myself at Level 5 ready to battle at a nearby “gym”! But if you live in Texas (like we do), and it gets too hot to walk around, don’t worry! There is a company in Austin, Texas that is starting to do Pokémon GO City Tours! What? Crazy, right? But I bet they sell out very quickly. This way, someone else is doing the slow driving, while you hunt and catch lots and lots of Pokémon! 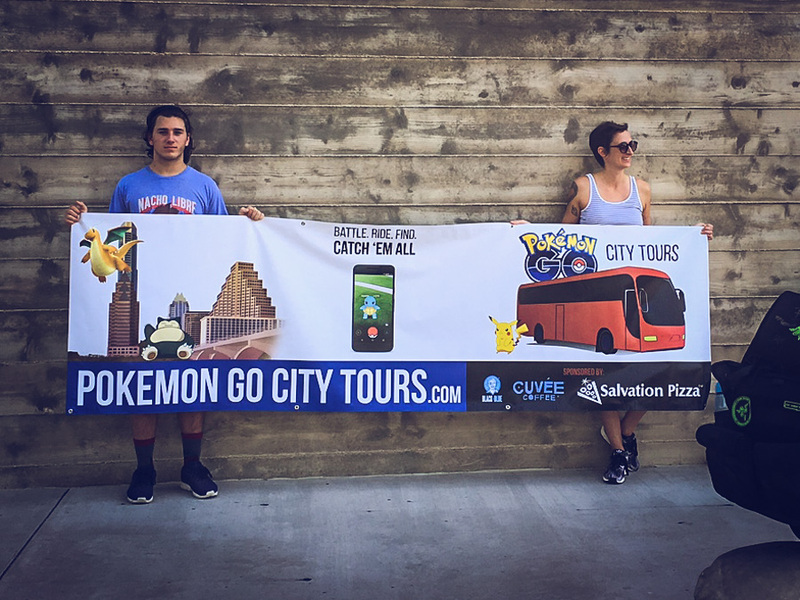 You can find more information on it in the article called Pokémon GO City Tours Debuts in Austin! 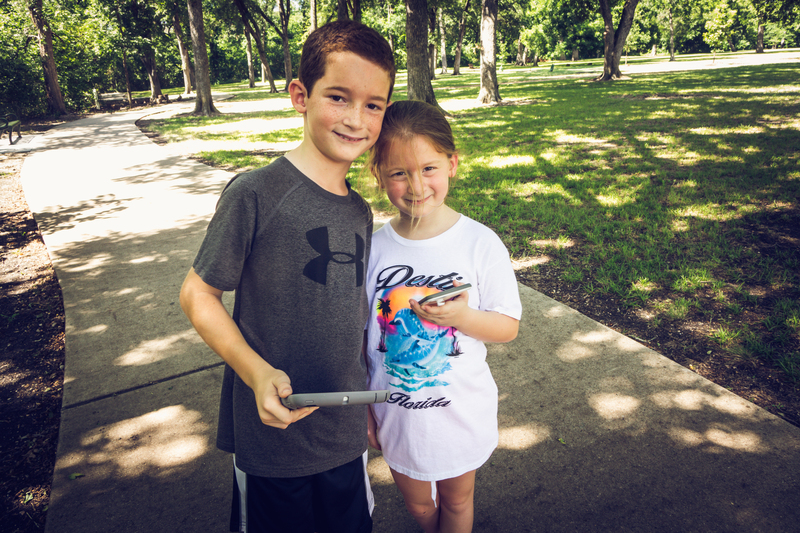 And don’t worry – if you’re not near Austin, I’m sure a Pokémon GO Tour will open up near you very soon! The founder of Pokémon GO City Tours founder, Philip Loyd says he came up with the idea after playing Pokémon GO in the backseat driving to get ice cream on Burnet Road. It’s unreal how much better Pokémon Go is while being driven around! You get a rush of adrenaline trying to hit every Pokéstop and catch as many Pokémon as possible swooshing by you at 35mph (I had to ask my girlfriend to slow down a few times and loved every red light we hit). I had 100x more fun driving around and playing than I did meandering around in my neighborhood. And so it began…Pokémon GO City Tours! Here are a few of the monsters I caught when I was roaming through the neighborhood with Zach. Impressive, right? Of course, Pikachú is my favorite! 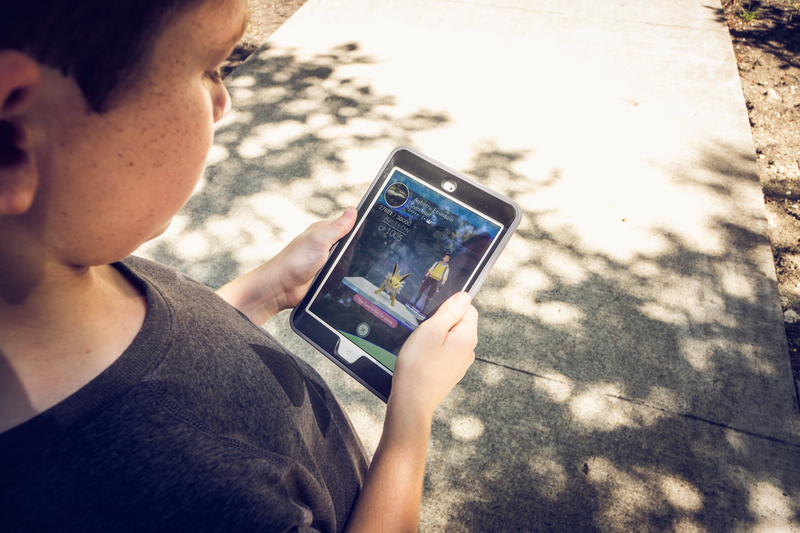 And don’t worry – if you’re not quite ready to step into the world of Pokémon GO, there are lots of fun Pokémon toys, figurines, cards, etc… You do not have to be left out – you can create your own Pokémon fun! My son started off with the cards – he’s collected so many over the years. I’m sure he’ll never touch them again now that he has the Pokémon GO app! If you’re wondering what happens when you catch on the Pokémon in the game, you can read all about it here in the article called This Pokémon Go Player Just Became The Very First To Catch Them All. 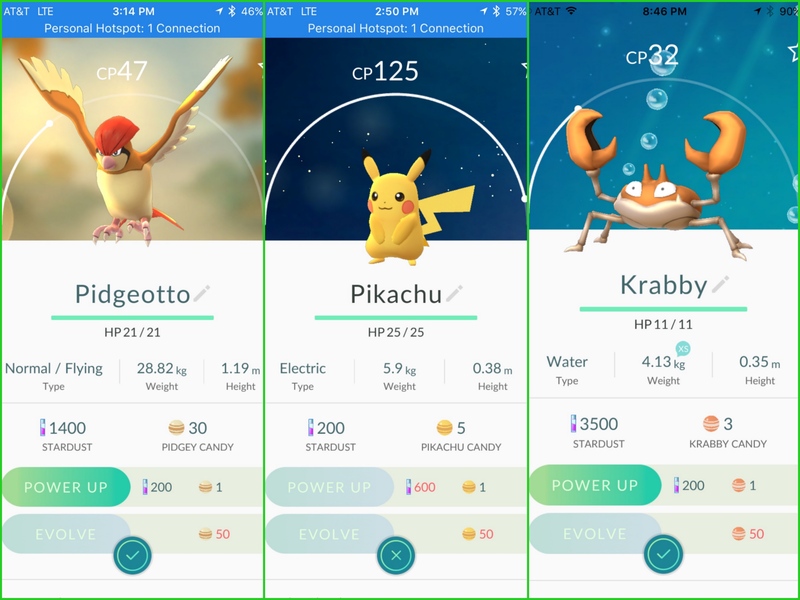 So much for me (I mean Zach) being the first person to catch them all. According to the article, Nick Johnson, 28, the Brooklyn-based Pokémaster, told BuzzFeed he walked an average of eight miles a day for two weeks to complete his collection. He found them all in New York City, except for 2 that he found in New Jersey. And yes…Nick has a full time job. Apparently, he made it up to level 31, he caught a total of 4,629 Pokémon, hatched 303 eggs, and he walked a total of about 95 miles. He would head out each night after work around 6:00 PM, and he would stay out as late as he could hunting Pokémon! While Nick was out walking the streets of New York City, he lost a total of 10 pounds! At this time, my kids are only allowed to go Pokémon GO hunting with me (or my husband)! I’m just worried that there might be some people who are up to no good lurking around the PokéStops, gyms, etc…! P.S. Here is a funny video from Ben Aaron. Fun to watch, and it also explains this crazy phenomenon! It’s called Ben Aaron Explores the Madness of Pokémon GO! The Top 5 Toys for Boys for 2016…What’s Hot? What’s Not?